Find out about ant management training on Hawai’i Island, the last Friday of every month, at www.littlefireants.com/AMC.html. Distribution: Big Island – widespread; Oahu, Maui and Kauai – localized detections are being managed by public agencies. LFA is not known to be present in Lanai or Molokai at this time. Description: Little fire ants will live in trees, including very tall trees such as coconut, shrubs, as well as in the ground and inside houses. In warm, shady and moist environments, LFA can grow to 20,000 ants per square meter with dozens of queens. 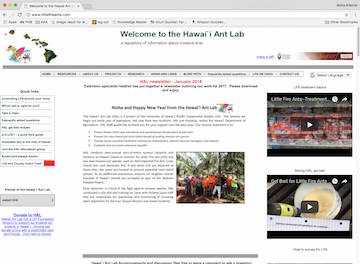 The Hawai’i Ant Lab gets calls from people at their wit’s end when their children and pets are being stung every day. Once established, LFA are very difficult to eradicate. Tree workers are much more vulnerable to being stung by them while up in a tree or while working on the ground, and they may make an infested tree off-limits. When you feel the sting, like a burning rash, the ants are already gone. Little fire ants cultivate sap-feeding pests in the trees they inhabit, and are suspected of driving away both native and exotic birds and other insectivores. Where there is LFA, pest problems in agricultural settings and forests multiply, and may contribute to canopy dieback and declines in orchards and forest health. LFA infestations have caused humans to abandon use of their properties on other Pacific islands, and have the potential to cause widespread ecosystem damage if keystone organisms are affected. Control: The Hawai’i Ant Lab recommends “sputter and jelly” to attract and collect ants for identification – a mix of peanut butter + jelly (not sugar-free, of course) + spam. All suspected LFA infestations should be reported to 643-PEST or www.reportapest.org. Do not try to manage LFA on your own. Research on biological controls has been under way but has not yet produced results. A multi-pronged approach including systemic pesticides, baits, treatment of infested materials, and reducing LFA-friendly conditions, is the best way to handle LFA problems. Currently, on Oahu, Maui and Kauai, the current strategy is the complete eradication of known populations, followed by multi-year monitoring. 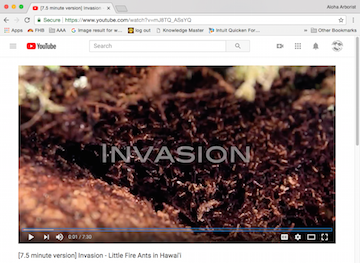 – Lee, Donna J., Michael Motoki, Cas Vanderwoude, Stuart T. Nakamoto, and PingSun Leung, “Huge Benefits from Managing Little Fire Ant on the Big Island,” Economic Issues. University of Hawaii at Manoa, College of Tropical Agriculture and Human Resources, September 2014 (EI-26).